I am an American living in Kathmandu. My family and I moved here last September to run the Solutions department at CloudFactory. 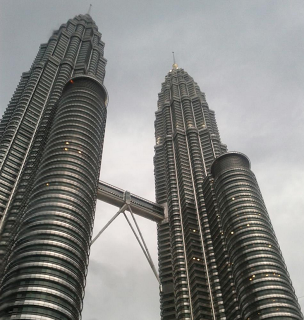 I flew recently from our new home city, Kathmandu, to Kuala Lumpur, Malaysia for a crowdsourcing conference. As one might guess from my profile, I am a fairly seasoned traveller. I booked a left window seat so I could catch a glimpse of Everest on my way. So I was a little perturbed when the guy who boarded ahead of me sat in my window seat and refused to change. I didn’t fight too hard, but I was grumpy to say the least. My passive stewing took a backseat to joy when I saw his utter excitement - along with the 40 Nepalis around him - when he got to see Everest. It was far more wonderful seeing him see Everest for the first time, than seeing it again myself for the third or fourth time. I realized my “seasoned traveller” status was being humbled by a plane of Nepalis - literally flying for the first time in their lives. When the flight attendants did the seat belt demonstration, a chorus of seatbelts buckling and unbuckling filled the cabin. When the airplane hit a small patch of turbulence, I heard fearful laughter as if it were a ride at Six Flags: Magic Mountain. Let me back up to share a quick description of airport security: The Kathmandu airport has two (and only two) metal detectors at the security checkpoint. One is for men, one is for women. The line for men was about 200 people long and slow going. The line for women had a low enough volume that a queue never really amassed. I had noticed this, but hadn’t understood. I had run through all sorts of scenarios - why would women here fly less? Are men here just slow at metal detectors? The truth was, on that airplane and in that metal detector queue I was unknowingly embedded in what is normal for Nepal right now. It was a context I had heard of but hadn’t immediately felt until that flight. I slowly realized that these Nepali men, flying for the first time, were doing what millions of Nepalese men are doing right now - leaving their country and families for work. Each had signed up with a manpower agency. Those agencies export “cheap labor” from Nepal to other countries. These manpower agencies are, in one strange sense, in the same business as CloudFactory. We both want to employ Nepalis. What is of course different between any such agency and CloudFactory is that their workforce, these 18-24 year old men, will not see their families for the next three years. They have chosen a notable sacrifice to go work in Malaysia on three-year contracts. Along the way, they hope to send some money home to their families. Nepal owns a spot on an unfortunate “top 5” list - that of countries who export labor at alarming rates. This means families are split, tears are shed, money is remitted, but toil is reality. A shocking percentage of the entire Nepali GDP is foreign-earned money remitted home. It doesn’t need to be this way. And let’s be clear: this is not immigration. Immigration is good and healthy. To them, this is short-term necessity. I started to chat with one young man who had excellent English. He asked if he could friend me on Facebook (sure, I guess). He’s from the birthplace of Buddha, but until this particular day he had lived in Kathmandu with his family. His older brothers have worked in Qatar, Saudi Arabia, UAE, and Malaysia ahead of him. He is really excited for this work opportunity. Will he come home to visit? No. If he stops working, in his words, he’d break his contract and become a slave of the company for whom he’s working. (There are stories of companies literally holding the migrant workers’ passports, and other stories of workers simply never returning without word of how or why.) Common or not, he lives with this perceived fear. I asked him how much money he’d be making in Malaysia. His answer (after doing some foreign currency exchange rate math) came out to be just a tiny bit more than what our top earning cloud workers make right now. Could one quantify the cost of living and working abroad in terms of family time lost? For me, I work abroad, but I have the luxury of bringing my family along for this incredible journey. Perhaps someday, my new Facebook friend will be able to join our workforce - and come home to his family.